I know I just wrote about this album in my summer songs post but seriously, this LP is easily the best thing I’ve heard in months. I just cannot get enough of it and am marveling at its overall consistency and sheer sublimeness at times. 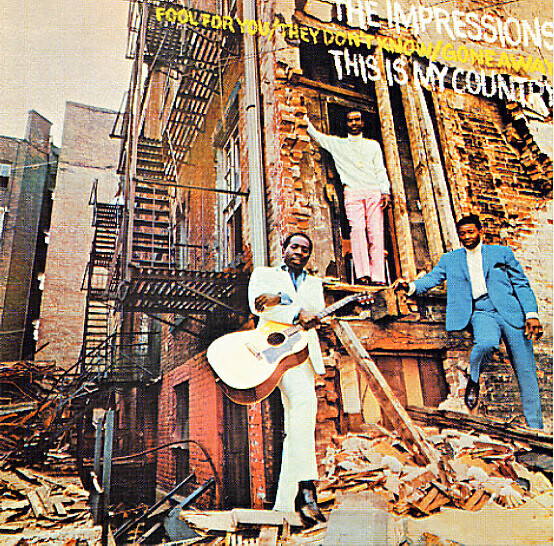 I feel sheepish that it took me this long to get around to listening the Impressions’ solo albums but if they’re anywhere near this good, I’ll be copping the catalog soon. I’ve been trying to figure out, in my own head, just what makes the sound of this album so incredible to me and so far, the best I can come up with is: everything. The vocals, the melodies, the rhythm section, the sense of drama, the sense of delicate lightness, the lilt in Mayfield’s voice, the hooks that haunt you; take your pick. I haven’t been this enamored by a soul album since…I don’t know…discovering Eddie Kendrick’s People…Hold On (and that’s one of my all-time favorites).